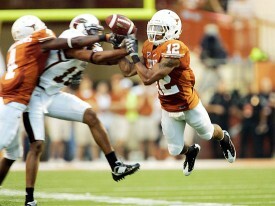 Redshirt sophomore safety [tag]Earl Thomas[/tag] won’t be back in 2010 for the Texas Longhorns. The Thorpe Award finalist out of West Orange-Stark has announced he is leaving school early for the NFL. The news is not unexpected but didn’t think we’d get confirmation so soon. 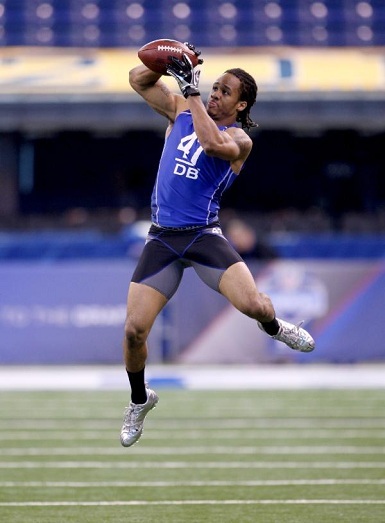 Earl is projected to be drafted in the middle of the 1st round so this is a good decision for him and for his family. You go to college to prepare yourself for your future career and Thomas has done that (and then some) in his three years at Texas. Athletically he seems ready to play in the league and his biggest negative is his size which wouldn’t improve with more time on campus. Thomas’ departure leaves the Horns a little thin on experience in the secondary for 2010. At safety, starter [tag]Blake Gideon[/tag] is returning as is the promising [tag]Christian Scott[/tag] but neither has man coverage skills Thomas does. Someone else from the group of guys including [tag]Kenny Vaccaro[/tag] and [tag]Nolan Brewster[/tag] will also need to step up. WTH?! (What the Heck?) moments are attempts to find the memorable and the off-beat perspective on Longhorns sports. 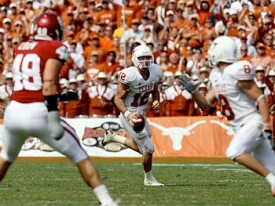 Here are some interesting moments from the Texas’ game against the Oklahoma State. Pregame WTH Poke Fans?! Wow, the biggest crowd in [tag]Oklahoma State[/tag] football history. You packed it in on Halloween night. You recorded 58,516 fans?! You did renovate the stadium with Boone Pickens money, didn’t you? 1st Qt. (5:56) WTH Burks?! Referee Greg Burks and his staff got a few calls wrong at the beginning of the game. The calls did benefit the Longhorns, but the personal foul call on OSU Lucien Antoine for hitting UT [tag]Dan Buckner[/tag] going across the middle was a good hard play. I wish the NCAA would get rid of the helmet to helmet hit when it does not involve the quarterback. The officials also missed it (1:19 – 2nd Qt.) when UT [tag]James Kirkendoll[/tag] was stripped of the ball when they assumed his momentum was stopped but never blew the whistle. Glad that the Horns blasted the Pokes on Halloween like a blue armadillo to make sure that these calls were not an issue. 1st Quarter (3:37) WTH PVC Man?! Oklahoma State degrades one of their own by having him hold a large PVC pipe flash card stand. A player, #23, for the Pokes holds an elaborate flip card that shows a heart, a number and an image on it for the OSU offensive package. The Poke player is auditioning for holding the leader board for the next round at the Masters. 1st Quarter (1:44) WTH Hubert?! Come on Hubert Anyiam from Oklahoma State. You had a gift touchdown pass that was perfectly placed to you by Zac Robinson on 4th down. (14:25 – 2nd Qt.) Then you got the ball ripped out by UT [tag]Sam Acho[/tag] which led to the first touchdown for the Horns. Oh yeah, great job ABC for cutting away and missing most of the play. 2nd Qt. & 3rd Qt. WTH Goonies?! The Longhorn defense played an incredible game especially the secondary which returned two interceptions for the touchdowns ([tag]Curtis Brown[/tag] – 2nd Qt. & [tag]Earl Thomas[/tag] – 3rd Qt.). But you need to slow down with all the nicknames. [tag]Lamarr Houston[/tag] comes up with the defensive nickname the Goonies because they like to goon it up with the opposing offense (Like that one). This week [tag]Sergio Kindle[/tag] comes up with the name “Texas Swagger” to get the team motivated to close the deal against the Cowboys. Coach [tag]Mack Brown[/tag] got into the act early in the year with giving out T-shirts with the logo .0128 which is the margin that they lost to OU for the Big XII championship. I guess I do not care what ploy is implemented as long as the Horns win. 3rd Quarter (10:27) WTH Case?! [tag]Case McCoy[/tag] is standing next to the lovely Rachel Glandorf (Colt’s girlfriend) and proceeds to spit on the floor right next to her. I guess the upcoming UT commit at quarterback is affecting his better judgment. Next up for the Longhorn’s is a trip home to face Central Florida at DKR Memorial at 11am November 7th.